Issue #196 is another of those giant all reprint issues fronted by a nice looking Murphy Anderson cover. It reprints stories that have already been covered here and there is no Golden Age reprint, pin-up page or any extra of any kind really. So there’s not much to write about. Well, yes there is, actually. Around the time that this issue was arriving, I was leaving again for New York City, again with the hope of establishing myself in a cartooning career. This time, however, instead of visiting the comic book companies, I would be meeting with people at the newspaper syndicates. I had returned home from New York the previous summer determined to go back to DC and Marvel with better work, but I got sidetracked. I had started doing a cartoon for a local paper, gotten a good response to it, and was now about to try my luck with a newspaper strip. For all the gory details, I recommend checking out the Match to Flame posts on this blog which cover this period pretty extensively along with examples of the artwork I was producing at this time. Suffice to say, I was beginning to see fellow Flash-Grams alums and other young artists and writers entering the field, and I was getting itchy to make my mark and join the party. That goal pretty much became the focal point of all my energies and my comic book reading dropped rather precipitously. So the Flash issues that the blog is about to encounter only got cursory readings at best and were not committed to memory to the same dogged degree the the earlier issues had. 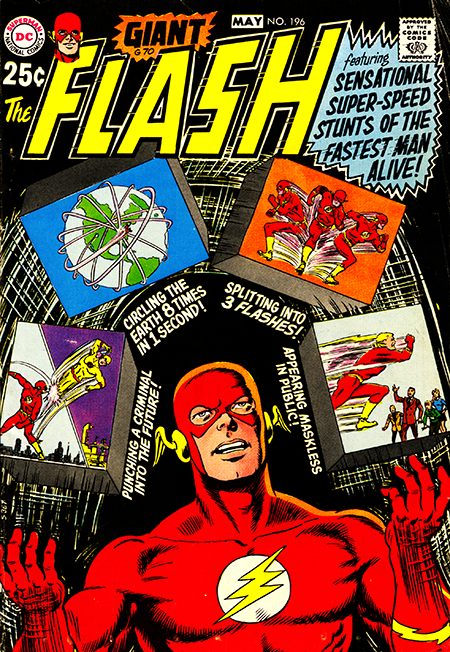 So in some ways the forthcoming issues will be somewhat “new” to me and I’m looking forward to rediscovering the Flash all over again. My personal “golden age” had passed and, although I didn’t know it at the time, I was not far away from settling into my “working age” and my life’s work.